The jigsaw classroom is a cooperative learning technique with a three-decade track record of successfully reducing racial conflict and increasing positive educational outcomes. Just as in a jigsaw puzzle, each piece--each student's part--is essential for the completion and full understanding of the final product. If each student's part is essential, then each student is essential; and that is precisely what makes this strategy so effective. A jigsaw listening or reading activity is an information gap exercise. Learners hear or read different parts of a text, then exchange information with others in order to complete a task. Learners in three groups hear different versions of an encounter with aliens. Together with other learners, they complete comprehension questions based on all three descriptions of the encounter. Jigsaw tasks are an excellent way to integrate the skills, as learners read or listen to a text, and speak and listen to others to reconstruct the information in the text. Most written texts can be made into a jigsaw activity easily. Managing a jigsaw listening exercise is more challenging as it requires multiple tape recorders, enough space to listen without disturbing other groups, and time. Divide students into 5- or 6-person jigsaw groups. The groups should be diverse in terms of gender, ethnicity, race, and ability. The class is divided into jigsaw groups (basic groups). They receive a task that consists of several aspects/segments.Each member of the group chooses one of the aspects/segments and prepares it individually and then assembles with the students of the other jigsaw groups that have chosen the same aspect. In these temporary expert groups (which should preferably not be larger than 5 students) each theme is acquired, discussed and a presentation is prepared. The experts return to their jigsaw group and inform each other about the aspects unknown to the others. The working materials (e.g. working sheets, literature, the internet) have to be chosen according to the ability, knowledge and experience of the students. Inexperienced students will need more instruction, guidance, monitoring and assistance from the teacher and time for preparing a presentation and the subsequent peer coaching. The members of the jigsaw groups may have to be reminded to take notes and encouraged to ask questions for clarification. In the beginning students might also need a timetable that leads them through the jigsaw classroom.The jigsaw technique is an efficient way to enforce the students to learn less teacher guidance. 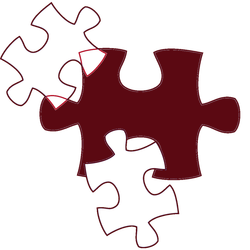 Furthermore the jigsaw technique supports skills like time management, preparing an oral report, presentation-techniques and soft skills. It encourages listening, engagement and empathy by giving each member of the group an essential part to play in the academic activity.